Andre Gray acknowledges the importance of beating the teams in and around the Clarets in the Championship, but the division’s leading scorer understands that nothing will be won or lost today. Having thrashed Derby County and taken a point against Sheffield Wednesday at Hillsborough the Clarets now take on league leaders Hull City at Turf Moor. Just four points separate the two teams in the table, though the Tigers have played a game less, while the pair top the form charts for the last six games. “It will be a big game but nothing’s won or lost there, so we just need to treat it as a normal game and hopefully get the three points,” said the £6m record signing. “It’s good to take points off the teams around you, but I think this league shows it’s not as easy as just beating the teams around you, you’ve got to beat the ones that are below you as well. 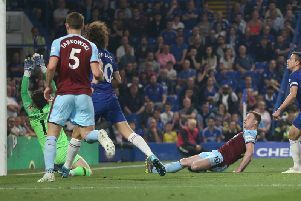 The striker feels his partnership with Sam Vokes is still growing and he’s hopeful that will be enough to fire the Clarets towards the top flight. We’ve got the quality to do it automatically and I don’t think anyone wants to go through the play-offs, because it’s a big gamble,” said Gray, who lost out to Middlesbrough in the play-offs with Brentford last term. “We want to get in the top two. Gray, who netted his 18th goal of the season against the Owls midweek, added: “We’re getting a lot more used to each other now. We all know what the style of play is. It’s coming at the right time but we need to kick-on. Former Bees comrade James Tarkowski was drafted in on deadline day, penning a three-and-a-half year deal at the club. And Gray believes that the new addition will prove to be ‘outstanding’ business for the club. “He’s a big physical presence, he’s technically outstanding and he’s got know how in this league,” said Gray. “He was outstanding for Brentford last season and he has been again this season, that’s why Burnley have come in for him.